Akira Kurosawa (黒澤 明 or 黒沢 明, Kurosawa Akira, 23 Mac, 1910 – 6 September, 1998) merupakan seorang pengarah filem, penerbit, penulis skrip lakon layar, dan penyunting filem dari Jepun. 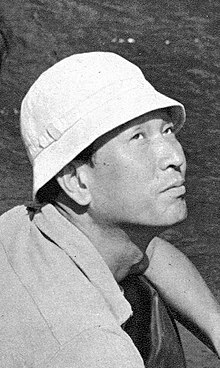 Ia dianggap sebagai salah seorang pembikin filem paling penting dan berpengaruh dalam sejarah perfileman, Akira Kurosawa mengarah 30 filem[note 1] dalam tempoh kerjaya 57 tahun. ^ In 1946, Kurosawa co-directed, with Hideo Sekigawa and Kajiro Yamamoto, the feature Those Who Make Tomorrow (Asu o tsukuru hitobito); apparently, he was commanded to make this film by Toho studios, to which he was under contract at the time. (He claimed that the film was shot in only a week.) It was the only film he ever directed for which he did not receive sole credit and the only one that has never been released on home video in any form. The movie was later repudiated by Kurosawa and is often not counted with the 30 other films he made, though it is listed in some filmographies of the director. See Galbraith, pp. 65–67, and Kurosawa's IMDb page. Laman ini diubah buat kali terakhir pada 01:58, 27 November 2018.